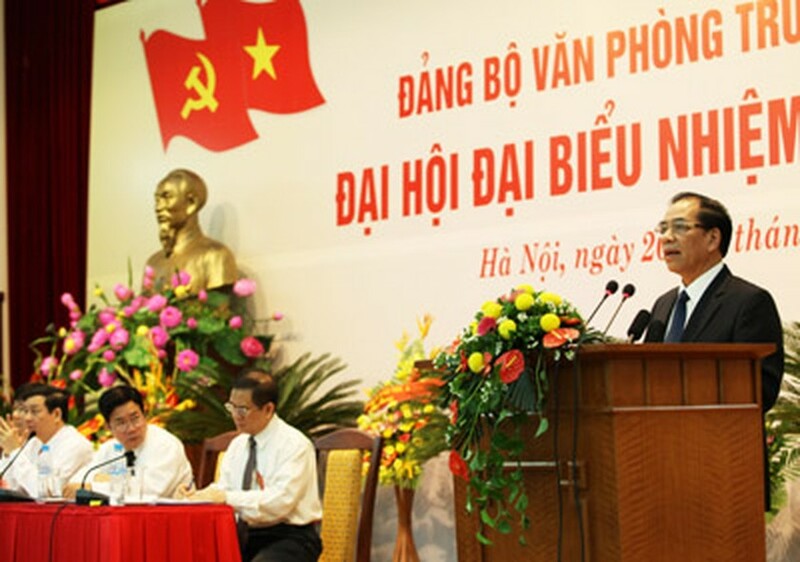 Party General Secretary Nong Duc Manh and politburo member and permanent member of the Party Central Committee's Secretariat Truong Tan Sang yesterday attended the congress of the Committee's Office in Ha Noi. The office is among the few Party organizations to elect its own secretary at its congress rather than by the newly elected executive committee, as has been the custom. Mr. Manh said that in the last five years, the office had strengthened the traditions and advantages of an office designed to counsel and serve the leadership of the Party Central Committee, Politburo and Secretariat. He said the office's task was very heavy and difficult and called for the best efforts from office leaders and staff. The Party General Secretary asked the staff to unceasingly improve their political quality, sharpen their fighting techniques, be absolutely loyal to the Party - and protect Party policy. Staff should keep improving their morality, be honest and simple, said Mr. Manh. They should also help Party leaders grasp situations at local Party committees to help organize the 11th National Party Congress next year. The Party General Secretary also asked the office to encourage staff and Party members to raise their responsibility, solidarity and unanimity. The two-day congress ends today. Meanwhile Prime Minister Nguyen Tan Dung and Politburo member Nguyen Van Chi checked preparations for Party Congresses in northern Nam Dinh Province as well as central Quang Binh and Thua-Thien Hue provinces. The two accepted the situation reports from the provincial party committees as well as their plans for the next five years during the meetings, which began last Sunday and ended yesterday. The Prime Minister asked members of all three provincial party branches to continue to collect ideas and quickly complete their reports for their congresses. They should also explore and analyze ways to take advantage of local potential, he said. The Prime Minister also praised the efforts and achievements of the provinces during their 2006-10 tenure. Nam Dinh had averaged GDP growth of 10.2 per cent, Quang Binh 11 per cent and Thua-Thien Hue more than 12 per cent. The number of poor households had been reduced at an yearly average of 2-4 per cent. The provinces also increased the number of industries and services; attracted investment; ensured national security and defense and maintained political stability. But the provinces had failed to meet targets for the transfer of rural laborers to the industrial and services industries. In Nam Dinh 66.1 per cent of labor was devoted to the land and in Quang Binh the rate was more than 70 per cent. The Prime Minister urged the administrators of both provinces to focus on exploring the potential use of land and labor to ensure socio-economic development during the next five years. He advised the administrators of Nam Dinh to introduce modern technology to agricultural production and the province's trained workers to attract more enterprises in the hi-tech zones. They should discuss making the province the centre of the Song Hong (Red River) Delta, he said. The Prime Minister suggested that Quang Binh Province should take advantage of its 5,000ha of forest to grow industrial trees for timber and persuade enterprises to invest in aquaculture, tourism and its Hon La Economic Zone. He asked that the poverty in the province's 32 poor communes be eliminated during the next five-year tenure. Central Thua-Thien Hue Province should use modern technology to ensure high-quality farm produce to meet local demand and tourists, he said. It should also take advantage of its infrastructures to develop the hi-tech industry, tourism, and culture. The Prime Minister asked the three provincial committees to identify their strengths and weaknesses in dealing with corruption. They should foster and train young officials, including females, to meet the demands of the country's development and global integration, he said. The Prime Minister also asked the three committees to continue their tradition of leadership; increase the fighting spirit of Communist Party and reinforce the people's solidarity and unanimity to meet their targets.